On Monday, October 2, 2017, LTG Charles D. Luckey visited Tufts for a wide-ranging conversation about the U.S. armed forces, the future of conflict, and the state of American civil-military relations. 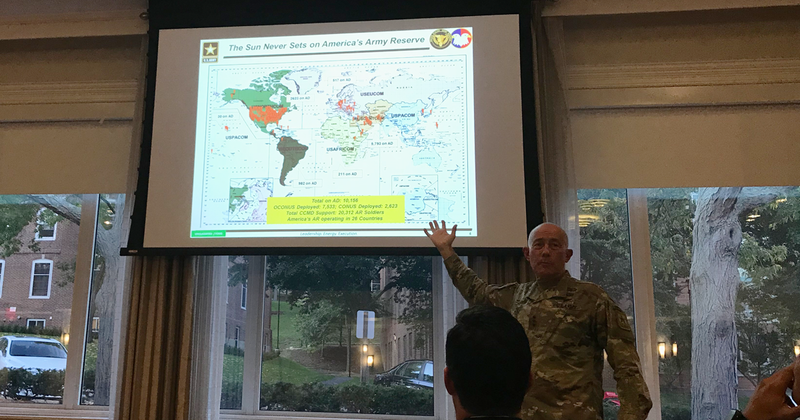 As the Chief of the U.S. Army Reserves and Commanding General of the U.S. Army Reserve Command, LTG Luckey spoke with the authority of four decades of experience and insight. Three groups sponsored the event: Tufts ALLIES, the Tufts University International Relations Program, and the Fletcher School of Law and Diplomacy International Security Studies Program. After speaking generally for around ten minutes about his career and the general purposes of the U.S. Army Reserves, LTG Luckey opened himself up to questions from the audience. He provided his perspective on a wide range of issues including (but not limited to) the future of civil affairs officers, the dangers of soldiers’ overreliance on advanced technology, the plethora of challenges facing the U.S. in the months and years to come, and various efforts to train and prepare America’s warfighters for the conflicts of today and tomorrow. Among the areas about which LTG Luckey voiced concern were the U.S.’ readiness to confront near-peer adversaries, the perilous ramifications of global climate change, and the emergence of new kinetic and non-kinetic domains. On several occasions during the event, LTG Luckey took care to emphasize the importance of nurturing the relationship between the civilian and military sectors of society. Although demurring about whether he saw a “divide” between the two realms, he acknowledged a mutual lack of understanding and appreciation. LTG Luckey spoke in favor of a national conversation about all forms of service. He also acknowledged that a move away from the all-volunteer force to a military draft “might not be the best thing for the Army, but it might be the best thing for America culturally.” Additionally, LTG Luckey discussed several recent initiatives – including the recruitment of talent developed by technology companies in Boston, Mountain View, and elsewhere – to take advantage of the many talented individuals whose skills could help preserve and protect the United States.